MONTREAL—Federal documents show the Canadian government feared Haiti was at risk of a popular uprising following last year’s devastating earthquake. Documents marked “secret” and obtained by The Canadian Press say the earthquake in January 2010 created a political vacuum that was likely to be exploited. They also mention rumours that former Haitian president Jean-Bertrand Aristide was plotting a return from exile in the immediate aftermath of the tremor. The documents were prepared by officials at the Department of Foreign Affairs and released through access-to-information legislation. They detail Ottawa’s extensive concerns about the legitimacy of the Haitian government and the scope of the reconstruction efforts. Haitians are currently awaiting the preliminary results of a recent presidential election run-off. 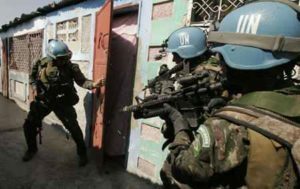 I am not surprised that someone wonders about the Preval government’s legitimacy since Preval received 23% in the 2005 vote – which was raised to 51% by Brazilian and Chilean members of MINUSTAH in order to avoid the constitutional run-off. In other words, the Preval government, now in place, has absolutely no legitimacy. Immediately after the quake, both Preval and MINUSTAH disappeared for more than a week. Preval was drunk at his girlfriend’s house. This would later be amended, in media stories, to the concept of him being in the yard, feeding his grand daughter.